Disclosure: I was compensated for this post. All opinions expressed are 100% my own. The pressure is on! Do you feel it yet? I’m talking about the stress that comes with getting everything ready for the holidays. I’m feeling it already. There’s so much to do and it sometimes feels like there aren’t enough hours in the day. I think one of the biggest tasks for me and I’m sure many others is holiday shopping. I have quite a few people I need to buy gifts for and I’d like to get it all done with time to spare. That’s the goal anyways! I’ve been a mom for 15 years and have learnt a trick or two about how to make holiday shopping as simple as possible. In fact, I’d even say that holiday shopping is actually fun and doesn’t have to cause you stress. Today I wanted to share with you five holiday shopping tips to help make the experience easier and even save you some money. 1. Get organized. The first thing I always do before I even attempt my shopping is to get myself organized. This includes making a list of everyone I need to buy for and also setting my budget of what I can spend. I use an Excel spreadsheet to keep everything organized, but you could use a free Google Drive spreadsheet or even a notebook the old-fashioned way. Once you purchase a gift, remember to record it on your spreadsheet and also put the amount you spent. I also subtract the amount from my total budget so I know how much money I have left. I noticed that when I don’t keep a list I end up overspending and buying too much for one person and not enough for another. Staying organized from the start saves so many headaches and makes holiday shopping much more enjoyable! 2. Avoid the crowds and shop online. This tip is gold to me! I’ve been shopping online for years and it’s my preferred way to shop for the holidays. I despise winter driving and there’s a limited selection of stores in my rural area. airmilesshops.ca, a one-stop shopping mall, gives me access to so many awesome stores and bonus offerings. The best part, though, is that I never have to leave my house and can get some shopping done whenever I have a spare minute. It saves me both time and money! It’s really a no-brainer for me that I’ll do the majority of my shopping from the comfort of my home. 3. Shop stores that offer rewards. I’m a huge AIR MILES reward miles Collector and love to rack up my reward miles with my holiday shopping. If you’re going to be buying gifts, why not shop at stores that offer you something in return? For example, at airmilesshops.ca you can shop over 140 online retailers and earn reward miles. Keep an eye out for Bonus offers which are available for a limited time and let you earn anywhere from 2x to 10x the reward miles. In fact, to celebrate Black Friday, you can earn 10x the reward miles when you shop with airmilesshops.ca until December 4th. A few of my personal favourite retailers found on airmilesshops.ca include Amazon.ca, the Apple Store Canada, Toys “R” Us, Old Navy Canada and many more. After all my holiday shopping is done, I can redeem my reward miles for a nice gift…for me! 4. Check shipping policies BEFORE you start shopping. Whenever I visit an online retailer, I always click to see their shipping policies. I look for their shipping method, estimated delivery times and rates. For Canadians, it’s important to first check if the store even ships to Canada. Isn’t it frustrating to spend time shopping on a site and loading up your cart with gifts only to find out that the store doesn’t even ship to Canada? When shopping through airmilesshops.ca, not only are Collectors earning reward miles on brand name Canadian retailer sites, they are also earning reward miles on purchases made with tons of different American retailers that will ship to Canada too. I’ve been online shopping for a few years and tend to stick to the stores that I know ship to Canada. airmilesshops.ca is a Canadian site and all of their retailers will ship to Canada. Also, remember to start early enough so that you leave enough time for your purchases to arrive before the holidays! 5. Take advantage of free shipping. When you’re checking the store’s shipping policy, also look to see if they offer free or discounted shipping for orders over a specified amount. I tend to cross a few people off my list by shopping the same store and taking advantage of free shipping. In the long run, you’ll save both money and time. For instance, Amazon.ca has free shipping for orders over $25 and you can earn AIR MILES reward miles if you visit the site through airmilesshops.ca. I’ve got about 75% of my holiday shopping completed so far. If all goes well, I’ll be finished very shortly! 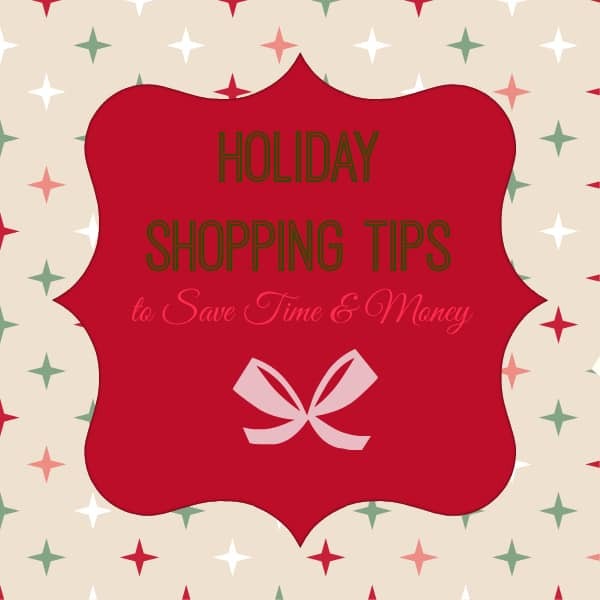 Do you have any time-saving or money-saving tips to make holiday shopping a more enjoyable experience? Thank you for the tips I love to do my online shopping! Thank you for writing this, I need all the tips I can get. I tend to stress out around Christmas and after reading this I took your advice and did some online shopping instead of battling the crowds 🙂 Unfortunately I have no tips to offer but I will be using all of these ones from you! I never thought about getting air miles rewards when shopping online. So silly of me… That is an excellent tip, thank you.